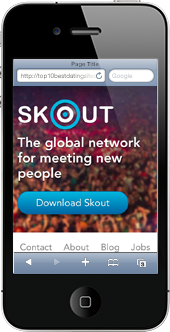 Designed as a mobile application, Skout’s interface is different from most mobile dating apps. Available on the Android and Apple markets, the app is colorful and easy to use. Users can flip through the singles in their area, get notifications, and view messages all from their mobile phone or tablet PC. Skout offers two apps for Android and iOS. Users can choose between the free Skout application, and the paid application known as Skout Plus. The free app offers as much as the paid app. There are just a few more bonuses with the paid app. Both apps are simple to use and allow all users to communicate effectively. Skout is free to use and register. However, to send virtual gifts, view private photos, and remove ads, users will want to download Skout Plus. Skout’s interface is playful and colorful. User choices are presented in circular tabs making it simple to navigate. The app also uses the swipe method to switch between screens and your user options. Skout.com takes safety seriously, and they’ve changed their age restrictions. Users 13 and under are not allowed a profile on Skout. Additionally, Skout’s website promotes online dating safety with their Safety Awareness Center. They’ve also split their community into two groups: Teenagers and Adults. Users age 13 to 18 are given a community separate from the adult community. Separating the community by age groups helps Skout to be a safe app for people to chat and meet.